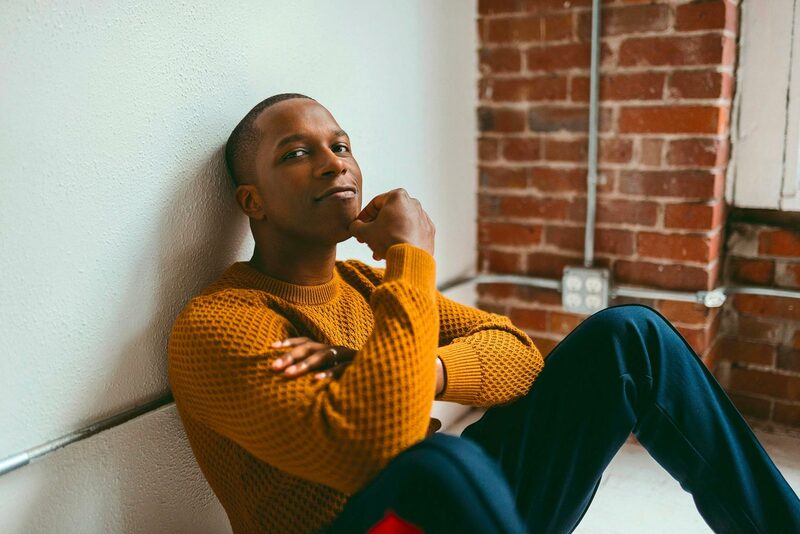 Leslie Odom Jr. has performed in front of sold-out crowds around the world, first in the Broadway classic “Rent” and, most famously, as Aaron Burr in “Hamilton,” one of the most acclaimed shows in recent memory. The Tony and Grammy winner has also performed at UVA, in front of the Rotunda during UVA’s historic bicentennial celebration in 2017. Now, Odom will take the stage at UVA for the second time. He is set speak at John Paul Jones Arena on Saturday at 3 p.m. as part of UVA’s President’s Speaker Series for the Arts. Tickets are free and available through Newcomb Hall, the John Paul Jones Arena Box Office and online at ticketmaster.com. Among other topics, Odom – who has appeared in several television shows and films and is working on his second album – will discuss his memoir, “Failing Up: How to Take Risks, Aim Higher and Never Stop Learning.” In it, he shares insights from his early career as an actor and all of the successes, failures and lessons learned that have helped him create a career he loves. We caught up with Odom before his visit to talk more about his career, his advice for students and aspiring artists and his New Year’s resolutions. Q. You just returned from the “Hamilton” debut in Puerto Rico, a special occasion for the island and for the show’s creator, Lin-Manuel Miranda. What was that like? A. It was wonderful. I was mainly there for vacation; my wife and I took our first trip without the baby. [Odom’s daughter, Lucille, was born in April 2017.] We had a great time, and we got to see “Hamilton” open there, which was so special. It is amazing to see this show travel around the world, touching audiences. The “Hamilton” family just keeps growing, and I have loved seeing actors I have known for years, like Isaiah Johnson [now playing George Washington] and Donald Webber [Aaron Burr], get swept up in it. Lin’s main objective in taking the show to Puerto Rico was to bring the “Hamilton” party home, where his parents are from, and raise money and awareness for the island. Tourism is a huge part of the Puerto Rican economy, and the show can draw attention to that. The food was great, the nightlife was great, we had a ball. Q. When did you realize that you wanted to make a career in the performing arts? A. For me, I didn’t realize I wanted to be in show business – I realized I wanted to be in “Rent.” That show was my “Hamilton.” I knew every word, knew all the cast members’ names, and it just meant a lot to me. I dreamed of being in it, and went to an open audition in my hometown, Philadelphia, at age 16. I got cast, and that was the first time I realized what it could mean to be a professional actor. Before that, I had no idea what that looked like, how you supported yourself. I started meeting people who had made their lives in theater, seeing them in action. I was so fortunate to get that inside view, and it helped me understand what I was preparing for when I went to study drama at Carnegie Mellon [University]. Q. In your book, you write about your father-in-law and mentor, Stuart Robinson, who jumpstarted your career when he asked what you were doing each day for yourself to further your career, whether you were getting roles or not. How did that advice help you, and how can UVA students start applying it in their own lives? A. College is a great time to practice that advice. If they are anything like me, many UVA students are right at that crossroads between owning their lives and what they do each day and pleasing parents, professors or other role models. Make sure you do something each day that helps you walk toward whatever it is that makes you come alive – the thing that you are passionate about, that you love to do, that you would do for no money. I am not talking about leisure, although that is important too. I am talking about the work that makes you feel useful and purposeful. It takes time and discipline, but I believe the 10 to 15 years after college are all about filling your life with more and more of that thing. Q. What advice do you have for students and others currently looking for a great mentor? A. If you work on yourself, hone your instincts and truly do the work that each of us needs to do to live a more honest life, those great people will cross your path. You will attract them. When that happens, don’t let them go. Get their email, get their phone number and stay in touch. Take them out to lunch. Go see what they are a working on, or what they are teaching. Participate in their lives. It’s as simple as that. When someone crosses your path who inspires you, or who you learn from, don’t let them go. Q. You wrote about your visit to Charlottesville, in the context of the August 2017 Unite the Right rallies. Looking back now, what stands out to you about those events and the local and national conversations they started? A. As I wrote in the book, what really struck me was how the students and the University community stood up and said, as one, “This is not who we are. You do not get to define us. We get to define who we are.” UVA is working to own its history and take responsibility for the pain and the darkness and the reality, while also laying claim to a brighter future. It was really special and powerful to see that. When I was invited to come back, I jumped at the chance. I couldn’t wait to come the first time, and I am just as excited this time. I want to check in, to see how your community is doing. I want to talk about how hard it is to have those conversations, to stay on that path you charted. I’m just really interested to know how UVA is doing. I am coming to listen as much as to talk. Q. We are in the first month of a new year. Any resolutions for 2019? A. I am on the hunt for joy. It was my new year’s resolution last year, too, and I can feel it happening. I am trying to walk toward joy, to attract joy. I am working on my second album right now, and when I hear the music back, I can hear the joy in it, and I think my band and crew can too. It’s the first thing I will be checking for this year. I want to be a magnet – and a detective – for joy.